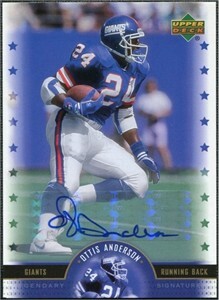 2005 Upper Deck Legends certified autograph card of former New York Giants running back Ottis (O.J.) Anderson, the MVP of Super Bowl XXV. ONLY ONE AVAILABLE FOR SALE.